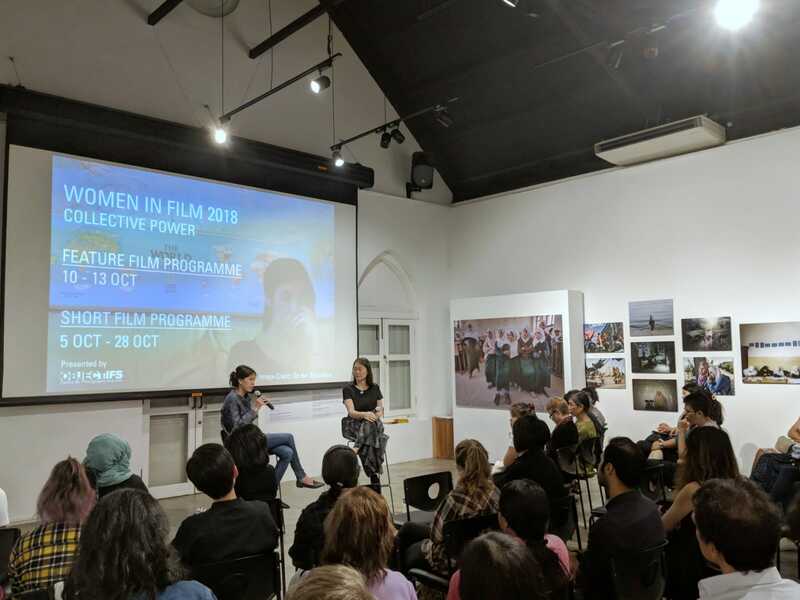 Women in Film 2018: Collective Power kicked off at Objectifs with a sold-out screening of On Her Shoulders, just days after the documentary’s subject Nadia Murad, a genocide survivor and human rights advocate, was awarded the Nobel Peace Prize. The film was followed by a post-screening discussion with social justice advocate Christina Liew and filmmaker Chen-Hsi Wong. [Read more about the film and about them here.] Read on for selected highlights from their discussion. Their responses have been paraphrased for brevity. Christina: I felt the film treated its subject with dignity. It paints a portrait of Nadia Murad not just as a spokesperson but also as a person. Chen-Hsi: Many documentaries I’ve watched go a lot further in pushing their subjects to recount their traumas in detail. Alexandria is respectful of Nadia’s privacy and dignity. She does not dig into sordid details but is focused on Nadia’s interests. On the idea of “justice” and what it means… In the film, Nadia and her fellow advocates are advised that they must be prepared for a long-term struggle, that they need a long-term vision of at least ten years for their efforts. Is it still an effective strategy for them to seek audiences with heads of state and work with the United Nations? Christina: “Justice” is perhaps the one word said most often in the film. But what exactly does “justice” mean for Nadia and Yazidis? Is justice taking ISIS to the war crimes tribunal? That is a process which realistically takes ages; some war criminals from the Holocaust are only just being indicted. And yes, few organisations globally have the same reach and influence as the United Nations. The reason for reaching out to heads of state is that Nadia and her fellow advocates are requesting them to accept Yazidi refugees as immigrants, ideally so that the community is kept together rather than split up further across multiple countries. Is justice when the Yazidis reunite as a community and can return to their land? You see two to three refugee camps in the film, and I think they’ve already shown the “nicer” ones. Even though Nadia and the Yazda advocates are seen making visits, trying to arrange humanitarian aid and handing out toys to the kids there, refugee camps are in a sense not meant to be comfortable long-term accommodations, but transient housing till the residents can be resettled. But in reality, these things take a lot longer than they’re meant to. In a way I’m glad that at the end of the film we see Nadia return to her village of Sinjar, because as we saw from the devastation there, there’s really nothing to go back to. As she says, the Yazidis get lower visibility and priority compared to other refugees as their community is small. But what stands to be lost in resettling them is not just their homes but also their religion, culture, practices, ways of life. Chen-Hsi: The documentary On Her Shoulders and Nadia Murad’s book The Last Girl can actually help spread awareness of her story and the plight of Yazidis, because these media can reach wider, general audiences. Filmmaker Chen-Hsi Wong (L) and social justice advocate Christina Liew (R) facilitating a discussion after the screening of “On Her Shoulders”. On that note, what can we as audience members do after watching such a film? Christina: Each of us here is a citizen of a country, whether it’s Singapore or elsewhere. In addition to making donations, we can also practise advocacy by contacting our country’s leaders to seek action on such issues, whether it’s with the Yazidis, or other communities closer to home. Chen-Hsi: Alexandria is not claiming to be a historian or a journalist; the film is just one point of view. We all need to do our own research too. The worst thing we could do tonight is to leave this room without a sense of injustice, and we can ask ourselves what can we do? Women in Film 2018: Collective Power continues till Sat 13 Oct with three more Singapore premieres, each followed by a post-screening discussion. View the full programme and get tickets via our website. Women in Film is part of Objectifs’ annual Women in Film & Photography programme. Visit our website for full programme information.